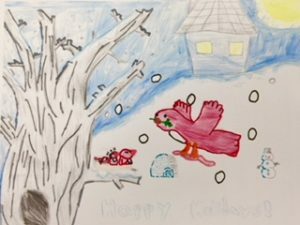 Mrs. Ackerman’s 6th grade Designers were given the task of designing a holiday card for BTI Consulting in Framingham. This is the fifth year BTI Consulting has been partnering with McAuliffe’s innovative designers for their animated holiday design which is sent to about 10,000 BTI clients. Students provided step by step directions of their vision for its animation. According to Ms. Joy from BTI “There were so many amazing designs and it was hard to choose a winner!” This year, the winner is 6th grader Connor B! Connor received a gift certificate to the Natick mall and all 6th grade participants were treated to some hot cocoa for their amazing efforts. The BTI animators are currently working on animating Connor’s design in time for this holiday season. We can’t wait to see Connor’s design in motion!